26/04/2019: At 18:00, opening of OPAK by Filip Harna, Anna Zanichelli, Abel Tournissoux, Branko Kante, Jean Casanova Castell, Thomas Amline. OPAK will then be visible from 27th April till 3rd May 12:00>20:00 (Studio 1 doorbell). 22/03/2019: Proposal for a Moving Frame by Emilie Terlinden & Lola Martins-Coignus. Opening dates: Fridays March 22, March 29 & April 5 3pm>3am. 11/03/2018: The Foundation launches its 2019 session of the "Prix Laurent Moonens". This is the sixth edition of this yearly competition, follow the links for détails ! 22/02/2019: ANCOLIE is a living proposal by Florence LAPRAT, Emmanuel ABITEBOUL and Loup LEJEUNE. Opening date: Friday February 22 at 6pm. Re-activation: February 28, 6>9pm and March 7, 6>9pm. 13/02/2019: Florence LAPRAT is shortlisted for the "Prix Mediatine 2019". Opening of the exhibition February 13, here is the link to the Facebook event. 04/02/2019: Visit to the studios and meeting the residents by members of the Jury and guests. See our page about the event. 01/01/2019: A very happy New Year 2019 ! Also, we are now on Instagram, thanks to our residents! 11/11/2018: Opening of "Le Regard Bas" at Rossi Contemporary in Brussels, a solo show by former resident Charlotte Flamand. Exhibition lasts till January 5. 10/11/2018: Current resident Florence Laprat features in "18cm X 13cm" at Cdlt+ Gallery in Liege, a group show including 26 artists. Amongst them are former residents, finalists and candidates of our yearly competition. Opening at 4:00pm, exhibition lasts till December 22. 30/09/2018: Filip HARNA, Florence LAPRAT, Clara MARCIANO & Emilie TERLINDEN just settled in their new studios where they will work till end of June 2019. The four winners will start their residency at the Foundation beguinning of october 2018. 28/06/2018: We just put on line our report page about PLAYTIME with pictures of some artworks. We warmly thank all participants who contributed to make this event a success. 05/06/2018: PLAYTIME is the fourth exhibition organized by the Foundation. Caroline Delaville , Charlotte Flamand, Leo Luccioni, Nicolas Stolarczyk and Sophie Vendryes will display works completed during their Art residency in Philippe de Champagne. 10/05/2018: Opening of Saturne, organized by guest Lucas Roman and seven other artists. Saturne ends our 2018 "carte blanche" program in the Foundation's Project Space. Details on the event page. 24/04/2018: Opening of SUNDOG, organized by Charlotte Flamand and Emilie Terlinden. SUNDOG is the fifth "carte blanche" given to our residents in the Foundation's Project Space. Details on the event page. 29/03/2018: Opening of "B[ o ]X", a video installation by Caroline Delaville, Thomas Collet & Jérôme Bonvalot. "B[ o ]X" is the fourth "carte blanche" given to our residents in the Foundation's Project Space. Details on the event page. 15/03/2018: Opening of HERN, a project by Sophie Vendryes and Diane Etienne. HERN is the third "carte blanche" given to our residents in the Foundation's Project Space. Details on the event page. 14/03/2018: Opening of "le redoublement" at artinkk featuring Leo Luccioni and Elsa & Johanna. Opening Wednesday 14 March 18:00 > 21:00, exhibition 15 March 2018 > 19 May 2018. 09/03/2018: The Foundation launches its 2018 session of the "Prix Laurent Moonens". This is the fifth edition of this yearly competition, follow the links for détails ! 01/03/2018: Opening of "_Atmosphere1" organized by Nicolas Guignon and Antoine Grenez as guest. "_Atmosphere1" is the second of "carte blanche" exhibitions giving our residents the opportunity to use and share our ground floor Project Space. 21/02/2018: Celine Cuvelier and Joao Freitas, both former residents, are selected for "Prix Mediatine 2018". Opening of the exhibition and award ceremony wednesday 21st February at 18h30. 08/02/2018: Opening of "Aftershave" organized by Leo François Luccioni and guests. "Aftershave" is the first of a series of "carte blanche" exhibitions giving our residents the opportunity to use and share our ground floor Project Space. Details on the event page. 26/01/2018: Opening of "Bonnes Résolutions" at the Cdlt+ Gallery in Liege, featuring Charlotte Flamand and other artists. Here is the invitation ! 25/01/2018: Opening of "Papier(s) II" at the Galerie Lazarew, featuring Valentin Capony and other artists. 18/01/2018: Opening of "Variations On Raw" at the Quincaillerie des Temps présents, featuring Leo François and other artists. 13/01/2018: Opening of "Berlin Alexanderplatz" at ETE 78, rue de l'Eté 78, 1050 Ixelles, featuring Céline Cuvelier and other artists. On the last day of 2017, we visited the MOCAA (Museum Of Contemporary Art Africa) just opened in Cape Town last September : here are a presentation of this outstanding project and a walk through the building guided by the chief curator. 27/11/2017: Visit to the studios and meeting the residents by members of the Jury. See our page about the event. 25/11/2017: Opening at 12:00 of "There is Always an Alternative" group show organized by Platform 102 in the Foundation Project Space till January the 12th. 23/11/2017 : Elina Salminen presents "Unexpected" at Cdlt. Gallery in Liege. Opening at 6:30pm, exhibition lasts till January 6 2018. 23/11/2017 : Opening at Galerie Nardone of the first solo show by Valentin Capony. Opening at 6:00pm, exhibition lasts till December 16. 16/11/2017: Elina Salminen is shortlisted for the "Prix Collignon 2017". This thursday in Liege, exhibition and nomination of the winner . 10/11/2017: Céline CUVELIER features in "Plus Loin les Yeux" in the Penthouse of the Bloom Hotel. Opening at 6:00pm, exhibition lasts till November 22. Interview of the Artist. 30/09/2017: The new residents just settled in their studios. Caroline Delaville, Charlotte Flamand, Nicolas Guignon, Leo Francois Luccioni & Sophie Vendryes will work at the Foundation till June 30 2017. 02/09/2017: Thanks to the initiative of Benedikt van der Vorst and Cedric Lienart, both Art collectors and members of the "Prix Laurent Moonens" Jury, the Foundation is indirectly present at the Museum Dhondt-Dhaenens Garden Party Auctions : Sarah Caillard, Celine Cuvelier, Sophie Duventru, Maxim Frank, João Freitas, Philip Janssens, Sven Laurent, Nathalie Ledoux, Nicolas Riquette and Elina Salminen all past residents of the Moonens Foundation offered one of their works and feature in the Paddle 8 auction. Also past resident in 2014, Nicolas Bourthoumieux features in the Christie's auction. The full catalogue of the auction is accessible on the dedicated Museum DD page or can be downloaded here. 12/06/2017: We just put on line our report page about FULL HOUSE with pictures and some artworks. For those who still want to visit the exhibition, the last public views are on Saturday 17 and Sunday 18 June 13:30>18:30, or private view by appointment. 02/06/2017: Nathalie Ledoux features in "Bloodymary Show" at Cdlt. Gallery in Liege. Opening at 6:30pm, exhibition lasts till July 29. 31/05/2017: FULL HOUSE is the third exhibition organized by the Foundation. Valentin Capony, Céline Cuvelier, Nathalie Ledoux, Elina Salminen and Amélie Scotta will display works completed during their Art residency in Philippe de Champagne. Opening is May 31st at 18:30, viewing by appointment continues till June 4th. 27/04/2017: We have the pleasure to inform that two of our résidents : Amélie Scotta and Valentin Capony have been selected as members of the Casa de Velasquez for the year 2017-2018. Don't delay ! Go to our home page and follow the links. 20/04/2017 : Valentin Capony just won the first KoMASK Printmaking Award 2017 in Antwerp. 17/03/2017 : Opening of "Eléphants Blancs" at Under Construction Gallery in Paris, the first solo show by Amélie Scotta. Exhibition lasts till April 29. 07/02/2017: Visit to the Foundation and meeting the Artists by ±20 students from the drawing section of La Cambre, with the presence of Sharon Schievers (assistant) and Catherine Warmoes (professor). 23/01/2017 > 23/02/2017: The exhibition of photos by Mustache Muhanya and Alain Nsenga Pelesa moves to the Hangar Picha in Lubumbashi. Mustache and Alain were both winners of the "Prix Laurent Moonens - Lubumbashi Session 2015". 19/01/2017: Opening at 6pm of "Painting Fields", a show by Natalie Ledoux and Selçuk Mutlu at Cdlt. Gallery in Liege. Exhibition lasts till March 4. 13/01/2017: Opening at 6pm of "Ornements divers", a show by Elina Salminen and Daniel Wagener in the Foundation's Project Space. Exhibition lasts till February 11. 10/12/2016: Closing of "Space Out" solo show by Marc Buchy organized by Platform 102 December 10. Event on invitation. 19/11/2016: Visit to the studios in presence of the residents by members of the Jury and guests, followed by an informal lunch. See our page about the event. 28/10/2016: Opening of "Space Out" solo show by Marc Buchy organized by Platform 102 in the Foundation Project Space till December the 10th. 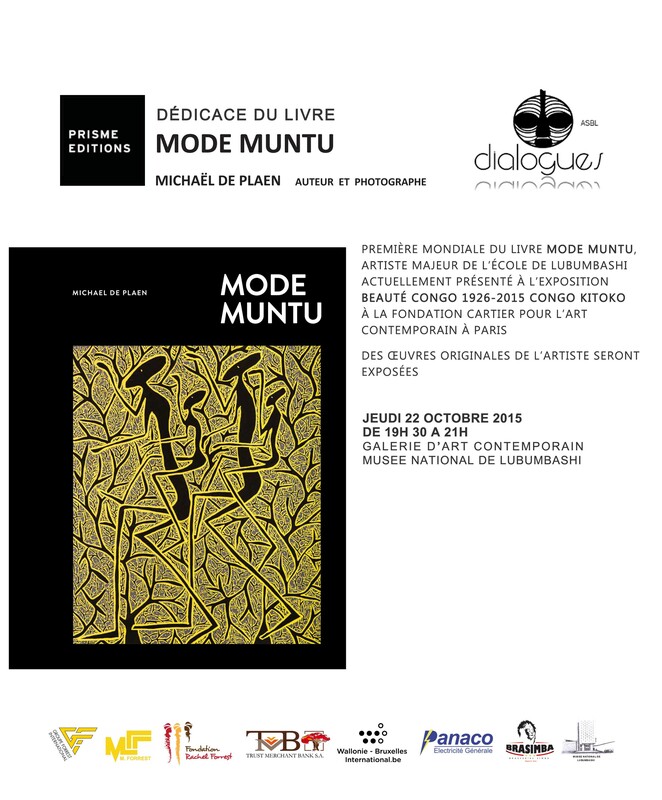 08/10/2016 > 29/10/2016: On line catalogue of the exhibition by Mustache Muhanya and Alain Nsenga Pelesa at the Galerie Dialogues in Lubumbashi - © ASBL Dialogues, Mustache Muhanya, Alain Nsenga Pelesa. Hamaji magazine n°13 features this event and the two photographers in its lifestyle-culture section - © Hamaji Corneille & Sima. 07/10/2016: Opening of the exhibition by Mustache Muhanya and Alain Nsenga Pelesa at the Galerie Dialogues in Lubumbashi. Both winners of the "Prix Laurent Moonens - Lubumbashi Session 2015" will present photographic works from 8th till 29th October. 01/10/2016: The new residents just settled in their studios. Amélie SCOTTA, Nathalie LEDOUX, Valentin CAPONY, Elina SALMINEN and Céline CUVELIER (as a guest sharing Elina's studio) will work at the Foundation till June 30 2017. 02/09/2016: In collaboration with the Foundation, Platform 102 invites you to a presentation of recent works by this year's Summer Studio Artists in Residence at the Foundation, João Freitas and Emi Kodama. The presentation will be held in the exhibition space of the foundation. In addition, the artists will open their studios to the public with Freitas presenting new works and Kodama a performance piece. 17/06/2016: We just put on line our report page about CURRENT STATE OF AFFAIRS... with pictures of some artworks. 10/06/2016: We are pleased to confirm the summer residency of João Freitas and Emi Kodama in collaboration with Platform 102. Both Artists will work at the Foundation July 15 > September 15. An exhibition organized by Platform 102 will end the residency. 03/06/2016: Due to the success of the opening of CURRENT STATE OF AFFAIRS... , additional public views are organized Sundays 12 & 19 June 13:00 > 19:00. 02/06/2016: CURRENT STATE OF AFFAIRS... Residents year II is the second exhibition organised by the Foundation. Sophie Duventru, Weifu+Ruifu Guo and Nicolas Riquette (with guests) will display works completed during their Art residency in Philippe de Champagne. Opening is June 2nd at 18:30, viewing by appointment continues till June 5th. 20/05/2016: Opening of Paperworks organized by Platform 102 (Brussels) at Antena (Chicago) featuring Léa Belooussovitch (FR), Marc Buchy (FR), João Freitas (PT), Saori Kuno (JP), Tramaine de Senna (USA). May 20 > June 17. 09/05/2016: We regret to inform that both Visa applications from Muphanya Mustache and Nsenga Pelesa Alain have been rejected on that date by the belgian authorities. We unfortunately have to accept that the worsening mix of migrants + terrorism in Europe combined with the potentially explosive political instability in the Congo RDC made the chances of getting Visas more and more remote. The residencies have therefore been converted into a cash prize for Mustache and a full-frame digital camera for Alain. 29/04/2016: Lea Belooussovitch at HD Gallery with Robin Gerris and Fabien Ruyssen. Exhibition April 29 > May 28. 20/04/2016: HD Gallery presents Robin Gerris (NL), Lea Belooussovitch (FR) and Ronja Schlickmann (DE) at "OFF Course Young Contemporary Art". Opening on Wednesday, April 20 3pm>11pm. Exhibition 20>24 April. 15/04/2016: Sarah Caillard & Brice Guilbert - NAPOLI in Ghent. 12/04/2016: Today, Laurent Moonens was born 105 years ago ! 24/03/2016: Opening of "Endless House II" at the Foundation. Group show by current resident Nik O'La Riquette with Emilie Terlinden and Claire Ducène. Exhibition 24/3 > 31/3 in the renovated exhibition space on the ground floor. February 2016: An article in "l'Art Même" n°68 gives a good overview of our credo and our actions : read it here. 01/02/2016: Building works are starting at the Foundation : the ground floor exhibition/performance space is being revamped as well as Studio 1 on the first floor. Photos when finished ! 14/01/2016: Opening of a group show including Sarah Caillard at Rodolphe Janssen. Sarah won the Laurent Moonens Prize in 2014 and was one of our 2014-2015 residents at the Foundation. 05/01/2016: Results of the "Prix Laurent Moonens - Lubumbashi Session 2015" have been notified to the winners: Muphanya Mustache and Nsenga Pelesa Alain will each be offered a 2 month residency in Brussels, while Assani Selemani Georges, who is only 16 years old, will receive a special prize in Lubumbashi from the Foundation. 12/12/2015: Visit to the studios in presence of the residents by some members of the Jury and guests, followed by an informal lunch. See our page about the event. 12/11/2015: Two openings involving last year's residents on the same evening ! A solo show by Sarah Caillard at Island and a group show featuring Léa Belooussovitch at Nadine Feront. We wish lots of success in their careers to both our 2014-2015 residents. 18/10/2015 > 27/10/2015: The Foundation moves to Lubumbashi DRC for 10 days. October 22 sees the world premiere of Michaël de Plaen's monography about Mode Muntu (1940-1985), one of the early students of Laurent Moonens in "Elisabethville" in the fifties. It is also the occasion to reunite other remaining early students of Moonens from that period. See our page about the event. During our stay we launched the "Lubumbashi Session 2015" of the "Prix Laurent Moonens" and auditioned nearly fifty candidates. 14/10/2015: Weifu & Ruifu GUO are invited to display their works at the Centrale.Lab 15/10/15>03/01/16. Opening is on October 14, détails here. 27/09/2015: Sophie DUVENTRU, Weifu & Ruifu GUO and Nicolas RIQUETTE moved into their studios in the Foundation House until end of June 2016 for their 9 month' residency. 06/09/2015: Public view of Lea Belooussovitch's exhibition at Platform 102 that will be held september 9 > october 15. 01/09/2015: Viewing of works completed by Philip Janssens during his summer residency organized by Platform 102 at the Foundation. On invitation only. 10/07/2015 > 10/09/2015 : In collaboration with Platform 102, we are pleased to welcome Philip Janssens for a summer residency in our studio 2. Philip is currently preparing a show with the Kiasma Museum in Helsinki. 18/06/2015: We just put on line our report page about NOT AN OPENING ...just a peek with pictures of some artworks. 28/05/2015: NOT AN OPENING ...just a peek was the first exhibition organised by the Foundation. Lea Belooussovitch, Sarah Caillard and Maxim Frank (with Sven Laurent as guest) displayed works completed during their Art residency in Philippe de Champagne. Opening was May 28th at 18:30, viewing by appointment continued till May 31st. 25/04/2015: Lea Belooussovitch and Nathan Anthony, current and former residents at the Foundation, take part in the project "FRICHE". 3 finalists of the 2014 edition of the Prix Laurent Moonens are also part of this project. 05/02/2015: Sarah Caillard and Nicolas Bourthoumieux are part of "Houston" presented by Island Gallery - catalog - . 29/01/2015: The new website for Lea Belooussovitch is now on line. 01/01/2015: A very Happy New Year to all and many thanks to those who took part in this project. Our Foundation was created in 2013, it found a home in 2014 and welcomed its first residents. Our plans for 2015 is to reveal it and open it to the Public. 28/12/2014 : Maxim Frank is joining us in our fourth studio for a six month residence. Maxim is also managing coordinator at "Maison Particulière" in Brussels. 25/11/2014: The Foundation is pleased to welcome Nicolas Bourthoumieux in one of our studios until the 5th of January. He will prepare his exhibition at Galerie Catherine Bastide due in Spring 2015. 10/09/2014: An informal lunch with members of the Jury takes place in presence of Lea Belooussovitch. The future spaces and studios of the Foundation are presented to the guests. 03/09/2014: A lease is signed for a building located n°50 rue Philippe de Champagne in Brussels : the Foundation now has a home.